Sally Hansen has been releasing some amazing collections lately! Today I have their new Moroccan Spice Market Collection* to share with you, well 4 out of the 5 shades at least. This collection released this July at Shoppers Drug Marts and Walmarts, making the polishes super accessible! "The ultimate quick-dry nail polish, Sally Hansen introduces the new limited edition Insta-Dri Moroccan Spice Market collection featuring a variety of exotic, bold shades. Designed with the incredible Insta-Dri formula, all it takes is one stroke, one coat and in 60 seconds you’ll have a manicure bursting with rich colour! Sally Hansen Insta-Dri in Pep in Your Step is a beautiful mid-toned purple with a fabulous formula. I used two thin coats for a rich & pigmented finish. This is a cream formula, and I think that it would also look great with a gold or silver glitter accent nail! Sally Hansen Insta-Dri in Sizzlin' Saffron is a bright canary yellow polish with a surprisingly good formula. For years I would avoid yellow polish like the plague because I always thought that all yellow polishes were streaky messes. Well Sally Hansen is definitely proving me wrong! Sizzlin' Saffron dried evenly without any streaks, and was fully opaque with just 2 coats. Sally Hansen Insta-Dri in Surspice! is a beautiful red polish with a creme formula. I don't normally wear red polishes on my nails, but I do think that this would make for a stunning pedicure colour. If you find red to be too striking or bold on your nails, try it on your toes! Sally Hansen Insta-Dri in Morocc-go is a rusty brown colour. I wasn't too excited about this polish in the bottle, but I did really like it once it was on my nails! The formula was creamy and easy to work with - opaque in two coats. This isn't a shade that I would normally reach for, but sometimes it's nice to step outside of your comfort zone! There's also a beautiful pink shade in this collection called Sumac Sonic. 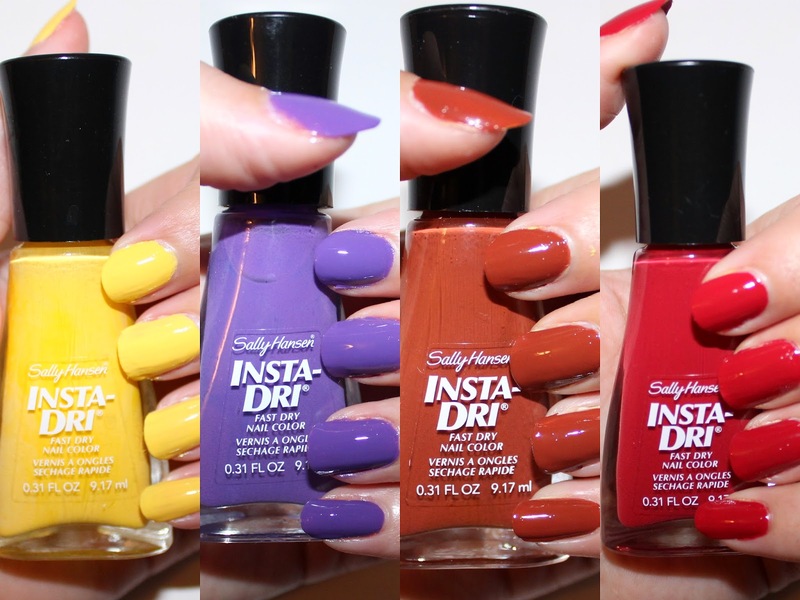 Sally Hansen's Insta-Dri Moroccan Spice Market Collection is limited edition, and the polishes retail for $4.95 each. My favourite from this collection is Pep in Your Step - I'm such a sucker for purple polishes! Have you checked out this collection yet? Which polish is your favourite? I also love the purple most but I was super impressed by the formula on the yellow! I was super impressed with the yellow!! these are all super nice looking shades! I really want to to get this entire collection now haha! Haha! I don't blame you! I have all except the purple. I am super in love with the red! I'm always on the lookout for a non-streaky yellow so I'll have to pick up this one!